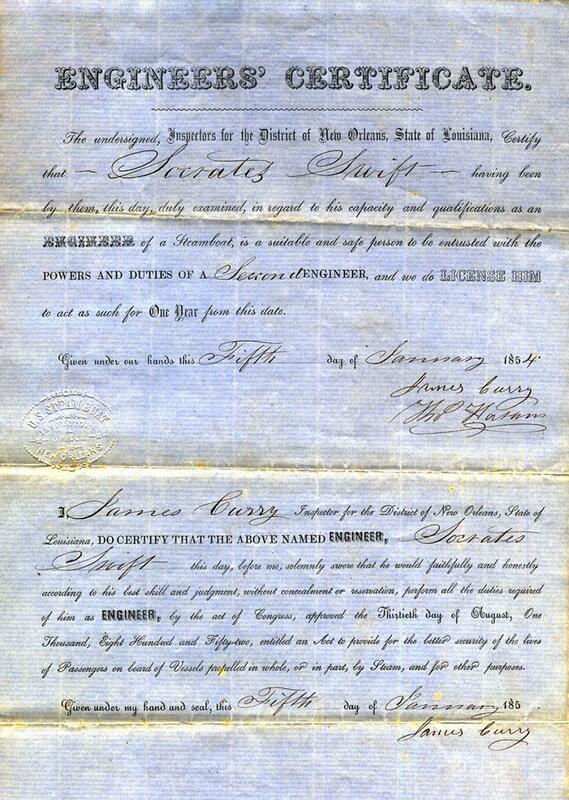 "ENGINEER'S CERTIFICATE Signed by Inspectors for the District of New Orleans Certifying Socrates Swift to be entrusted with the duties of a Second ENGINEER on board Vessels propelled by Steam, for a year from the Fifth day of January 1854." DISTRICT OF THE PORT OF PITTSBURGH. 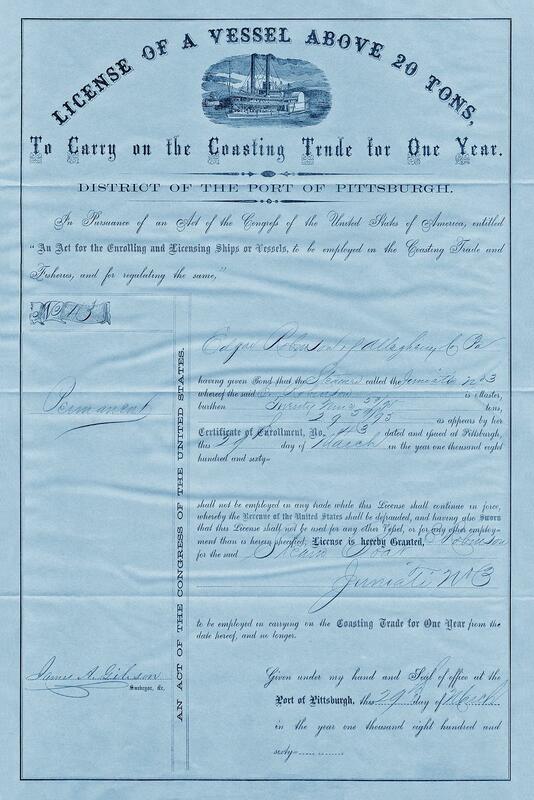 The original 1860 Pittsburgh license measures 10 1/4 X 16 1/2 inches. "An Act for the Enrolling and Licensing of Ships or Vessels, to be employed on the Coasting Grace and Fisheries, and for regulating the same,"
James A. Gibson, Surveyor etc. 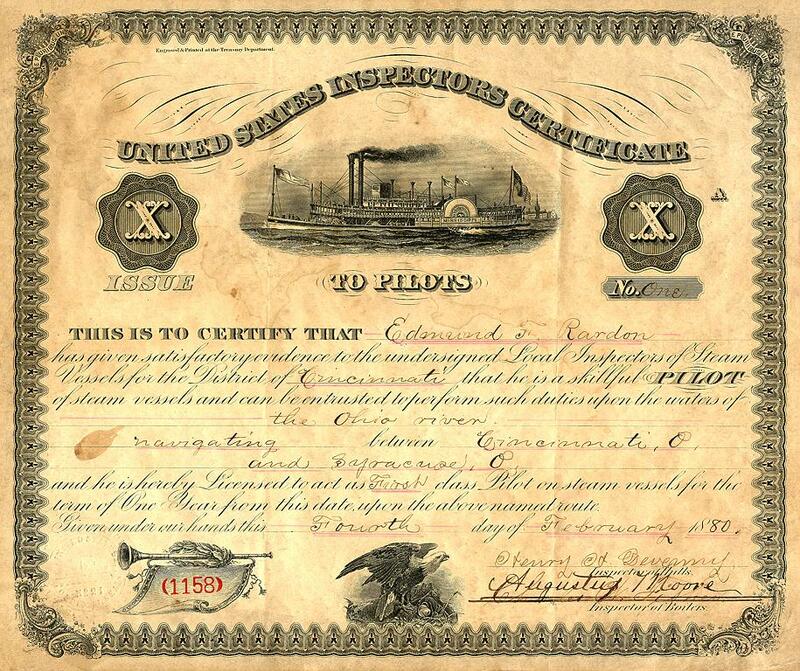 Edmund F. Rardon's first class pilot's license for the Ohio River 'twixt Cincinnati and Syracuse bestowed upon him on Feb 4th 1880 by Devenny, Inspector of Hulls and Moore, Inspector of Boilers. 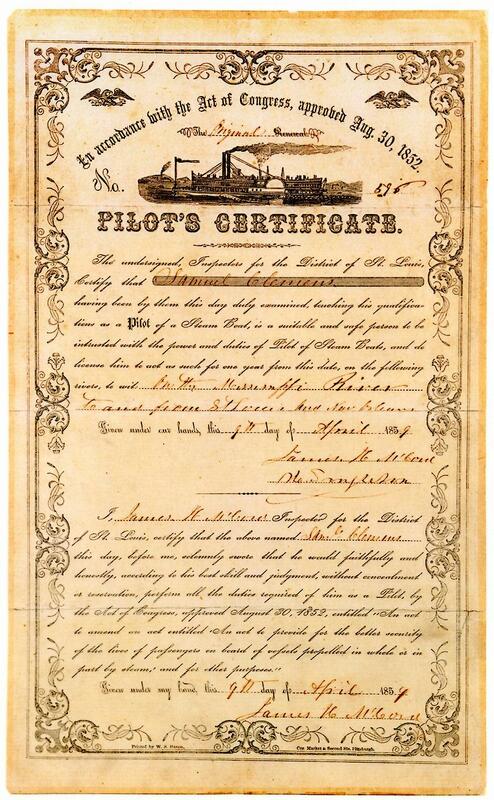 A 1855 pilot's "certificate" for Wm. J. Kountz who was a pain in the neck to Ulysses S. Grant during the Civil War. This particular 1852 U.S. printing office form and the steamboat vignette I had never seen before. 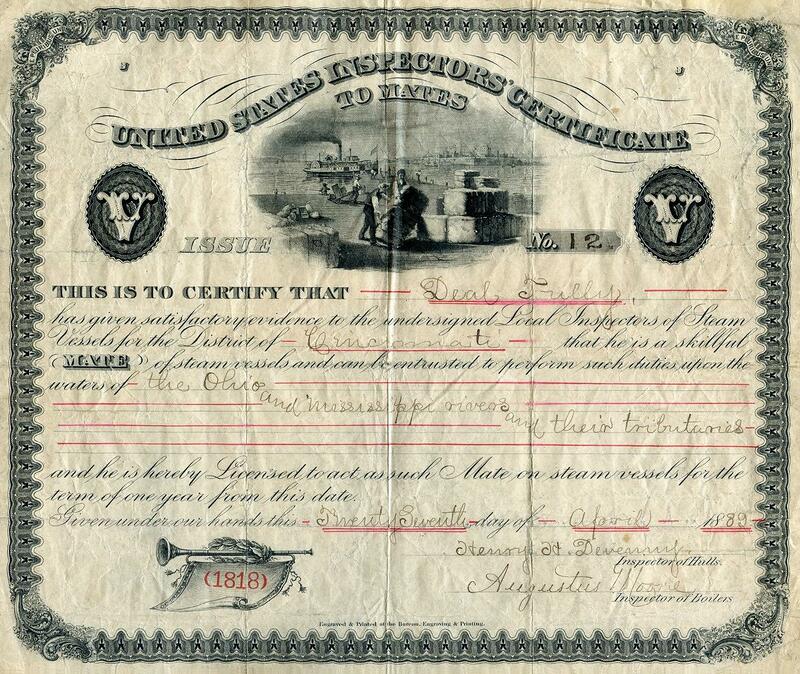 This is the only pre-Civil War Pilot's License I've been able to get a hold of so far. The excerpt from "Men of Fire" should probably be synopsized or abridged if it is used with the file which could go under Pilot Houses. 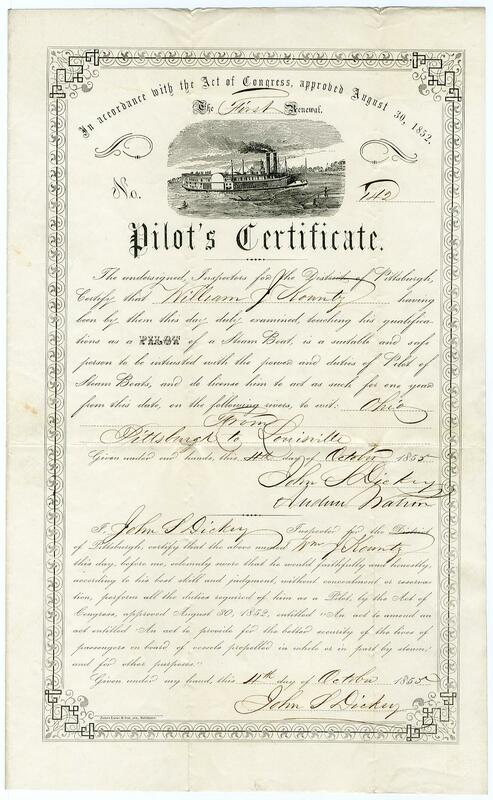 Attached scan of the first renewal of the Pilot's License for William J. Kountz was issued October 4th, 1855 and signed by John S. Dickey. Inspectors Dickey & his fellow inspector Andrew Watson were dismissed from their duties in 1858 after the steamer Fanny Fern (a boat they had inspected) exploded her boiler, killing 15 people. William J. Kountz was also a Steamboat Captain during the Civil War. He gained notoriety because of his conflict with Ulysses S. Grant. At one point, McClellan appointed Kountz "Superintendent of of water transportation of Troops and Supplies in western Virginia," on the Ohio & Kanahwa rivers. Kountz was part or full owner of several vessels, including the Henry C. Yeager, Carrie V. Kountz, Katie P. Kountz, John F. Tolle, and Mollie Moore, all of which were vessels in the "Kountz Line." Other records indicate Kountz owned a bank & other enterprises. This following account of the conflicts between Grant and Kountz is from Men of Fire: Grant, Forrest, and the Campaign That Decided the Civil War, by Jack Hurst, Basic Books 2008. Available from Amazon.com. Grant's greatest source of anxiety during the winter of 1861-62 . . . seems to have been William J. Kountz, forty-five-year-old owner of a Pennsylvania steamboat fleet. 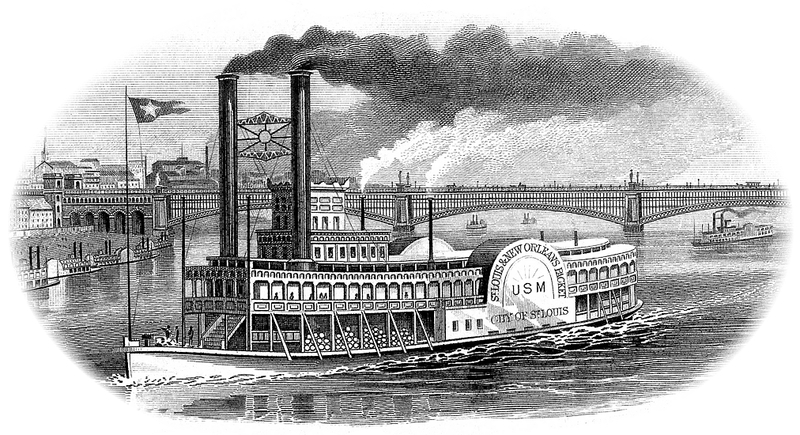 The war had blocked river commerce from the Mid-west to New Orleans and idled the bulk of the steamboat industry, and McClellan had recruited Kountz and some of his boats to assist in the eastern Ohio-western Virginia theatre. 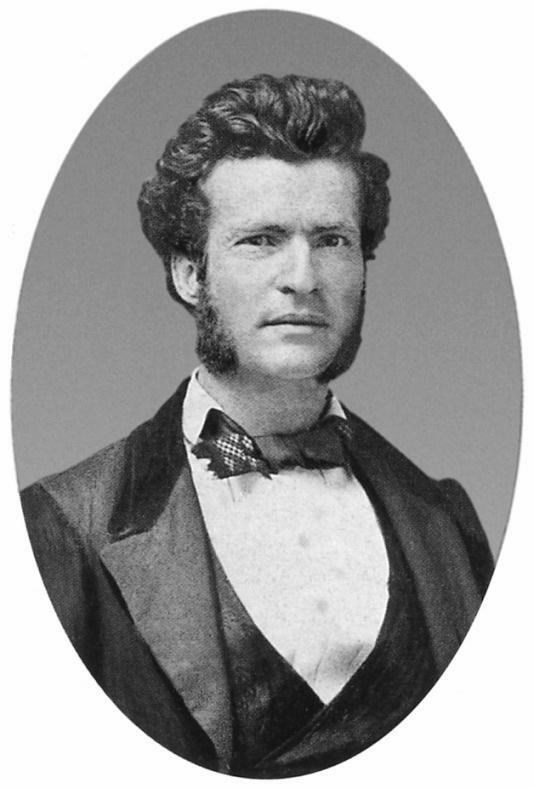 A river pilot for a quarter-century and a builder and owner of steamboats for more than two decades, Kountz became McClellan's superintendent of water transportation and doubtless expected to profit from authorizing the placing of some of his own inactive boats in government service. A postwar thumbnail biography asserts that during the summer and fall of 1861 Kountz "purchased all the steamboats that Were converted into gunboats, and also many other boats for transports." Due to the incompetence of Lincoln's legendarily corrupt first secretary of war, Pennsylvanian Simon Cameron, all sorts of suppliers were fleecing the government during this period. A friend would later assert that Kountz was rigidly honest, though, and McClellan clearly valued him, eventually sending him to St. Louis to organize river transportation there." Known for his abrasiveness, Kountz began stepping on toes in Cairo, asking questions without checking in at Grant's headquarters, soon after his arrival sometime in the latter hall of December. Grant penned him a stiff note saying he had heard the visitor had been "making inquiries into matters pertaining to this command" and ordering him to stop "until you have reported to me and shown your authority." It turned out, however, that Kountz had reported to Grant's subordinate, McClernand and he soon began implying that Grant was participating in corruption in steamboat and other contracts. Any such assumption was without merit. Financially honest nearly to the point of naiveté, Grant just the preceding week had followed up a Chicago Tribune report that there was corruption in lumber contracting in the office of his Cairo quartermaster. He soon reported that his investigation showed the newspaper's charges to he true and asked that the quartermaster be replaced. 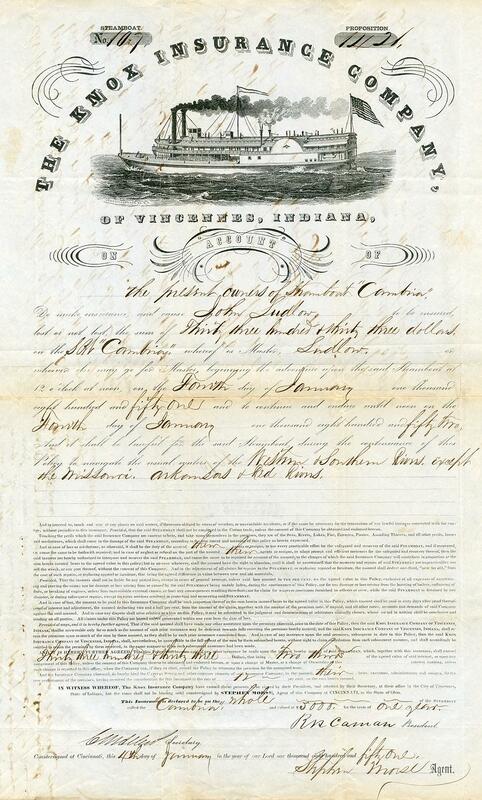 Periodically in deep need of money in the years before the war, Grant never tried to acquire it by cheating anybody. But, needing to make a favorable impression on Halleck, he was understandably leery of Kountz's clumsy probing. Even friends acknowledged that Kountz was overbearingly insistent, devoid of tact, and oblivious to military chains of command. In mid-January, Grant ordered him arrested, saying that the Pennsylvanian's "great unpopularity with river men and his wholesale denunciation of everybody connected with the Government here as thieves and cheats" had made it difficult to get crews and boats to move troops. Grant had been forced to also arrest some of the boatmen to get them to serve at all. He suggested that Kountz be assigned elsewhere, writing that the troublemaker seemed to want his position only to punish riverboat operators he disliked and to acquire government business for a craft in which he had invested. But Grant lodged no charges, saving that they would be "embarrassing to the service." Things got embarrassing anyway. In late January 1862, Grant found himself struggling to weather his most dangerous drinking controversy of the war with none of the credentials of victory that would sustain him through more clamorous episodes later. A reputation for thirst had dogged him front the old prewar army, but it had received renewed and wider notice the previous autumn. An October evening he spent reminiscing about the Mexican War with Smith in the Paducah, Kentucky, quarters of Wallace spawned lurid" newspaper "accounts of the meeting at my house," Wallace would later remember. It was an orgie [sic], a beastly drunken revel by both Grant. and Smith—so the story ran," Wallace went on. Wallace then offered a correction, although somewhat faintly: "There were liquors and cigars on the night in question, and some singing [italics added], but no intoxication or anything like a revel. Nevertheless, a charge against General Grant of habitual drunkenness arose about that time, and spread through the country." And into ominous circles. On December 17, a Galena citizen recently returned from St. Louis wrote to Grant's most influential sponsor, Illinois congressman and Lincoln intimate Elihu B. Washburne, that he had learned on "good authority that Gen] Grant is drinking very hard" and suggested that Washburne write to John Rawlins, a self-described liquor-loathing Galena lawyer and Grant aide who claimed to monitor and discourage Grant's thirst. Washburne did write Rawlins, who replied with a long, impassioned letter defending Grant. Rawlins said the statement that "Gen'l Grant is drinking very hard" was "utterly untrue" but acknowledged there had been occasions when visits by prominent Chicagoans and others did prompt the general to down single glassfuls of champagne or, during problems with a dyspeptic stomach, two glasses a day of beer. In "no instance," Rawlins insisted, did Grant ever drink "to excess" or "enough to in the slightest" hamper his job performance. But the rumors did not die. On December 30, abstinence fanatic William Bross of the Chicago Tribune wrote Secretary of War Cameron that he and associate editors at the Tribune had accumulated "convincing" evidence that "Gen U. S. Grant commanding at Cairo is an inebriate ... We think it best to call your attention to this matter. rather than to attack Gen. Grant in the Tribune." Noting that lie did not know Secretary Cameron personally, Bross gave references that included his Excellency President Lincoln." His friends rejected these charges as motivated by vengefulness, but Grant needed to get moving down the Tennessee River—or somewhere—while he still had an army. I was fortunate to find this MASTERS license some years ago. 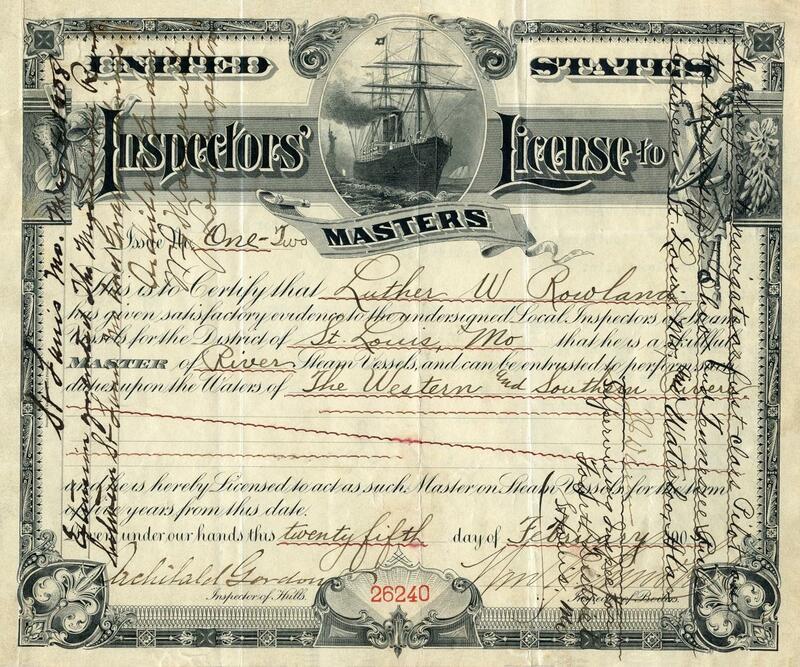 MASTERS licenses were issued to Captains ("Masters of Public Passenger Vessels") on Inland Waterways after they were given examinations by U.S. Inspectors of Steam Vessels. In the case of Luther W. Rowland he was also a pilot licensed to navigate the Mississippi, Ohio and Tennessee Rivers between Grafton, Illinois, St. Louis, Missouri and Waterloo, Alabama. On the reverse side of the document are notations regarding the renewal of Rowland's licenses for an additional five years. "This is to certify that Luther W. Rowland has given satisfactory evidence to the undersigned Local Inspectors of Steam Vessels for the District of St. Louis, MO that he is a skillful MASTER of River Steam Vessels, and can be entrusted to perform such duties upon the Waters of the The Western and Southern Rivers and he is hereby Licensed to act as such Master on Steam Vessels for the term of five years from this date. - - - (Illegible) - - -, Inspector of Boilers"
Master & Pilot of River Strs. U.S. Local Inspectors of Steam Vessels"
Examined and found to have been issued in proper form. In reviewing all blank spaces should be filled in with black instead of red ink. 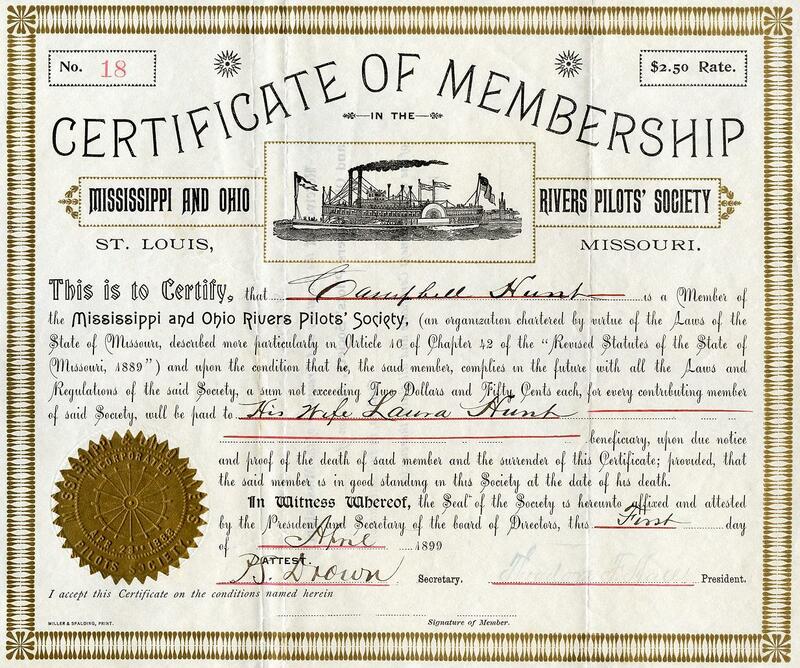 Insurance certificate in the MISSISSIPPI & OHIO RIVERS PILOTS' SOCIETY, St. Louis, Missouri issued on the first of April 1899 to Campbell Hunt to benefit his wife Laura in the event of his death. Attested to by PS. Drown and rubber stamped with the signature of Society President Theodore F. Hall. Apparently this was a serious document and not some sort of strange prank as the issuing of the certificate on "April Fool's Day" with the person attesting given as "PS Drown" and not signed on the bottom line by Campbell Hunt himself suggests. Of further interest is mention of the Pilots' Society having been established 10 years earlier under Article 10 of Chapter 42 in "The Revised Statutes of the State of Missouri, 23rd April, 1889.
another rarity from my collection . . . THIS IS TO CERTIFY THAT Deal Tully has given satisfactory evidence to the Local Inspectors of Steam Vessels for the District of Cincinnati that he is a skillful MATE of steam vessels and can be entrusted to perform such duties upon the waters of the Ohio and Mississippi rivers and their tributaries (and is) hereby licensed to act as such Mate . . . for the term of one year from this date the Twenty Seventh day of April 1889. Cub Pilot Samuel Clemens, 1858. Original Insurance Policy date August 27, 1851 for the steamboat CAMBRIA that I bought from Ray Samuel as his Garden District shop in New Orleans in October 1989. Attached "cover" and page one with vintage steamboat vignette. There is a lengthy hand written documentation of the sinking of the CAMBRIA as I understand it on the 25th March 1851 (in Fred Way's account the sinking occurred on the 3rd of February, 1851) and the settlement of the claim by Knox Insurance by their agent Stephen Morse. Built at Pittsburgh, Pennsylvania in 1845. Originally owned by Capt. William Forsythe, Pittsburgh, and Thomas Arbuckle of Allegheny City, Pa. Ran Pittsburgh-Cincinnati in a "Line," 1846. News of the initial skirmishes leading to the Mexican War came from New Orleans to Louisville in April 1846 aboard the PEYTONA, thence to Cincinnati on the YORKTOWN, and on up the Ohio to Wheeling and Pittsburgh on the CAMBRIA. The J.M. WHITE carried the news to St. Louis. Later ran Pittsburgh-St. Louis, Capt. Kindrick. Sank and lost upbound near Ste. Genevieve, Missouri., February 3, 1851, owned by a Capt. Ludlow who was in command. On Account of the present owners of the Steamboat "Cambria," Do make insurance and cause John Ludlow to be insured lost or not lost, the sum of Thirty three hundred & thirty three dollars on the STR "Cambria," where is Master, Ludlow, or whoever else may go for Master, beginning the adventure upon the said Steamboat at 12 o'clock at noon, on the Fourth day of January one thousand eight hundred and fifty one and to continue and endure until noon on the Fourth day of January one thousand eight hundred and fifty two. And it shall be lawful for the said Steamboat during the continuance of this Policy to navigate the usual waters of the Western & Southern Rivers, except the Missouri, Arkansas & Red Rivers. 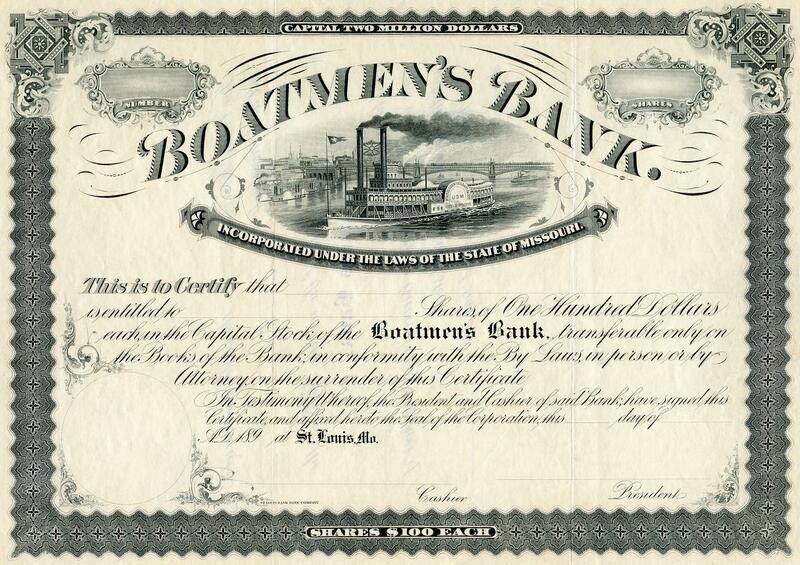 A check written by Sam'l N. Holliday from a Boatmen's Bank of St. Louis account on January 22nd, 1892. 2.35 x 8.40 inches. I scanned this engraving of the Steamer City of St. Louis from an original Boatmen's Bank of St. Louis stock certificate. Nice detail. This should be on some denomination of U.S. currency. I visited what was then the main office in St. Louis during the early 1980's to see Dean Cornwell's huge mural-sized painting "The Race of the ROB'T E. LEE and the NATCHEZ."